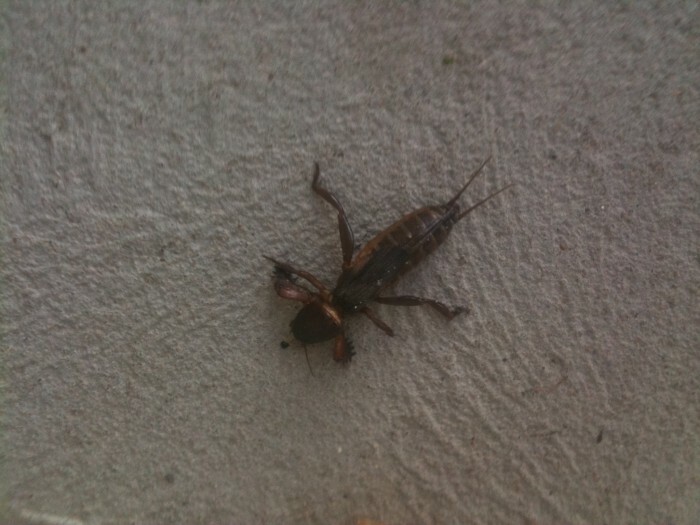 looks like a mole cricket.. you can tell by the ridged from legs… the bigger ones have a hell of a bite. HUH??? How the hell did you get one of these to bite you? They’re herbivorous after all. Are you sure he didn’t try to burrow while in your hand? They do that you know… it can feel a little like biting. Characterised most notably by the thickened, barbed forelegs (for digging, hence “mole” cricket). Another characteristic is the headplate (vertex) that is toughened and somewhat shield-like, creating a fluid surface with the thorax whilst tunelling. Mole crickets are omnivorous and are known to prey on worms and mites, and even birds. There are three tribes of mole crickets: Gryllotalpini, Scapteriscini, and fossils; each containing several genera of mole crickets. Looks like a ‘Sandgroper’ found in Western Australia?